sandbar, originally uploaded by c_p_lew. April is the hottest month here. I took this picture of the sandbar on the Mekong at 8 am - when the temperature was around 80 degree F and it was still possible for teams to play football and volleyball on the sandbar. Every year, different events are set up on the sandbar - last year, several groups had set up tents by the edge of the water and created 'sand castles' representing Mt. 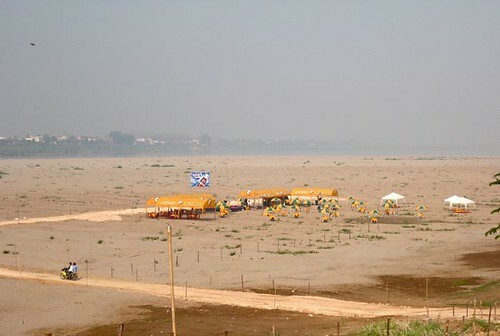 Meru, the center of the Buddhist universe, where people could make offerings in the sand. I'm sure they'll do the same thing for the Lao New Year during this coming weekend. And in a month's time, the rains will start, and whatever is built in the sand will all be washed away.